Here you'll find answers to frequently asked questions. Please download full instruction booklet here. For additional questions, please send an e-mail to service@gyrotwister.co.uk. I just received my GyroTwister and I cannot get it started. Is it my fault or is something wrong with my GyroTwister? How long does a GyroTwister last? How do I start the GyroTwister with my thumbs? 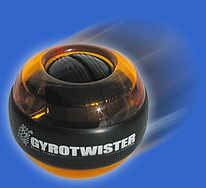 Is it normal that the GyroTwister makes such a loud noise? Why should I NEVER oil the GyroTwister? When I let the GyroTwister roll to a stop in my hand, it moves back and forth. Is that normal? Dust and dirt has accumulated in my GyroTwister and it´s not running properly. What can I do? Hold the GyroTwister with the opening point upwards. Spin the rotor withyour hand. It should continue spinning a few times on its own (from 5-20 times depending on how hard you spun it ). Hold the GyroTwister with the openingfacing downwards. Press the rotor upwards. It should have about one millimeterof room so that it rattles when you push it up or let it down. Hold the GyroTwister withthe opening facing upwards. Stick a coin in the rotor groove along the spotwhere the cord hole is, then press the coin a little harder. Now press therotor slightly upwards. You should be able to turn the rotor onto its secondaxle when you turn the coin (imagine the coin is a screwdriver). When you´veturned the rotor upwards so that it does not run up or down along the track, but is about 1 mm in the middle - now the rotoris easy to turn, and hits either above or below - then the friction shouldbe easy to detect. If nothing seems wrong during these tests, then your GyroTwister is ok. Should you have any further questions, please send an e-mail to service@gyrotwister.de. The GyroTwister must be used in a coordinated way. You can hear and feelwhether it's moving in the right way or not. If the GyroTwister is veryquiet , then it's being moved correctly. You are holding it tightly. If itrattles like crazy, then inner axle is not being guided properly but is being spun back and forth inside. Because the permanent rollingaction is lacking and the power is being heaved onto one point, the materialis being stressed enormously. If youjust jerk your hand back and forth, then the GyroTwister is not being guidedat every point it should. There is a phase when the rotor moves freely followedimmediately by a phase when the rotor is under pressure. Exactly then you'll hear a loud clacking sound. It can become critical when the real strength combines with pure power. Without coordination here, the rotor receives a impulse hit and lets it "spin" without any coordination. This kind of activity really stresses material. The 15 kg gyro power isnot being used to train you, but is being used against the device itself. Equally bad is when the rotor reaches high rotationspeeds and then "let go". This is also very stress ful for the material, sincethe roller does not come to stop, but is hit back and forth. Foreign objects should not get into the internal body. If cigarette ashenters the internal mechanism, then the GyroTwister become a grinder. Theforeign material is spun around the controlling guiders and creates wear on the plastic. For this reason you should neverstart the GyroTwister by dragging it over the carpet. Normally, carpets containdust which inevitably get into the GyroTwister's internal mechanisms. As long as you follow these guidelines and don't let the GyroTwister fall on the floor, you shouldn't see any noticeable wear. Should you have any further questions, please send an e-mail to service@gyrotwister.de. The one-handed thumb start is actually quite difficult and normally can be done by experienced users only. Hold the GyroTwister in your palm as far to the top as possible. The device should sit on your middle and ring fingers. The sides of the index finger and small finger should be touching the GyroGrip band. Now begin moving your thumb on the rotor in the direction away fromyour body. At the moment when you've thumbed, turn the GyroTwister as fastas possible upside down and start the rotation movement back and forth. Since the rotor moves more slowly in this start technique compared to using the cord or entire palm, you have to start the movement with more feeling. For this reason, it's advised to first be familiar with the GyroTwister movement before attempting the thumb start. Please do not be disappointed if it doesn't work right away. Most peoplefind it impossible to perform a one-handed thumb start. Should you have any further questions, please sent an e-mail to service@gyrotwister.de. The GyroTwister is not completely silent of course. A slight rattling isnormal. A strong, jerky rattling occurs when the GyroTwister is not used100% correctly. The rotor should be guided under "pressure" along every pointof the rotation. For example, if you jerk your hand from right to left, thethe GyroTwister is not being guided along every point. A phase occurs wherethe rotor moves freely followed by a phase where the rotor is under pressure. If this is the case then you'll heard a loud rattling. If this happens, then reduce the speed and try to guide the GyroTwister so that the rattling stops. The rotor builds up a stable movement, the user tilts the plastic casing away. The rotor wants to move into an upright position, but can do so only within the plastic casing. Now the axle is pressed strongly against the inner casing (on one side from below, on the other side from above). The axle now rolls away. If you would let oil enter the inner mechanisms, then the axle could no longer roll. Instead, it would skid. The rolling process is totally fundamental, because it allows the rotor to build up speed. Should you have further questions, please send an e-mail to service@gyrotwister.de. When I let the GyroTwister in roll to a stop in my hand, it moves back and forth. This is completely normal, but it should be avoided. If you reduce speed without keeping the rotor under pressure (this happens when you just hold the GyroTwister in your palm without really holding on tight to it), then the rotor is not being guided, but moves back and forth in an uncoordinated manner. For this reason you should "reduce speed" by keeping the GyroTwister held tightly, but do not provide it with additional energy. You'll maintain your GyroTwister better, because a rolling to a stop does not stress and wear out the material. In contrast during uncoordinated movement of the rotor, the wear is higher since the axle no longer rolls but is hit back and forth. Should you have any further questions please send an e-mail to service@gyrotwister.de. Dust and dirt has accumulated in my GyroTwister and its not running properly. What can I do about it? This is the best way to remove dirt, since spirits not only cleanse, but remove grease. Oil and grease are the GyroTwister's biggest enemies. They cause the axle to skid and no longer be guided properly. In addition, spirits do not leave any residue; water for example leaves calcium traces. Fill the GyroTwister with spirits and turn the rotor intensively in both directions, so that the deepest angles can be cleaned. Be careful when turning the rotor: The spirits will splash out so ensure that nothing gets in your eyes! Wash out the GyroTwister with soapy water and rinse it more than once so that no soap residue remains in the inner mechanisms. Turn the rotor in all directions while washing, so that dirt caught between the outer case and plastic ring is removed. As long as the GyroTwister is not completely dry it will not run very well. It's possible that it will not run perfectly even after some time (e.g. especially if you have hard water). Ideally, you should do the final rinse with distilled water so that any calcium is removed. Extinguish the GyroTwister with pressed air from a compressor or a spray can (available at the hardware store) while the rotor turns slowly. This method is not as effective as the first two, but it is the only suitable method when using the Xbeam, because the internal electronic components should never come in contact with water or cleaning spirits. Good luck with cleaning. Should you have any further questions, please send an e-mail to service@gyrotwister.co.uk.